My Home Theater system is fairly standard, but very high quality. It has a receiver that can switch 4 HDMI inputs and a slew of other types, a dual room DVR (Dish Network), Blu-Ray Player, Wii Console, a portable media player, and perhaps in the future – something like the Syabas PopBox streamer. There is nothing exotic, but in order to control the system I need 4 remotes and the one for the receiver was especially poor (Yamaha). I love gadgets and understand how things are connected and exactly what needs to be set to make it work, but I will admit that having to keep track of and use all of those remotes is a pain. Here is where the Bliss comes in – I also purchased a high end Harmony One universal remote control. 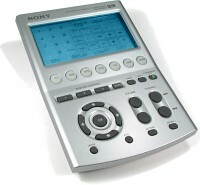 My previous universal remote was very nice (Sony AV-3000). It worked well at controlling my old standard definition Home Theater system (all Sony), but the setup procedures were a complicated combination of training and entering codes. It was full-featured, but not nearly as intuitive as the Harmony. I had no trouble using it, but SWMBO* could never figure out how to turn the system on or watch a movie. The Harmony One reflects several generations of improvements. I dare say that the Harmony One is perhaps the best Home Theater remote available today. 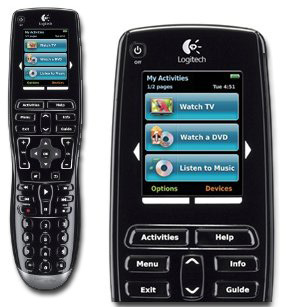 The first step with a Harmony is to create an on-line account with Logitech. You use the included software to describe each component in your system (make & model) and then describe how they are connected. Your system’s configuration is stored on the harmony site so you’ll never have to write down and save your programming steps. Once you have entered the basics you can then connect the remote control and all of the setup information is loaded into it. Even with just the basics programmed, you have a very useful setup that will likely exceed anything you have used previously, but you are not finished yet. When you select an activity the physical buttons on the remote are set to perform almost all of the normal functions that this activity will ever need. The button layout is practically perfect and intuitive. Any additional functions you may need (no physical button) can easily be placed on the touch screen. The touch screen displays various screens once you are in an activity. Programming for me was an iterative process. I used the remote, noted deficiencies and then reprogrammed. Occasionally the devices get out of sync power wise. This usually happens when you don’t aim the remote long enough and not all devices get the signal. You then want to manually power cycle the errant devices. When you bring the device menu up and select your device, the touch screen then displays buttons for each function on several pages. I was disappointed to find the power button several pages back (for all devices) so the next time I reprogrammed, I set them to appear on the first page along with whatever other functions I thought would be used most often. Next I add a few additional commands (no physical buttons) like DVR. These additional commands are soft buttons that appear on the touch screen when an activity is running. This saves button presses (no need to go to the device menus) for common tasks. My final setup was to add Favorite Channels. You can add up to 4 pages of 6 channels (24). I downloaded icons for each channel from the Logitech site. You can decide if you want these Favorites to appear by default when you watch TV, otherwise the commands menu will appear. All of the menus can be accessed by the bottom buttons on the touch screen. If you program Favorites, the Activities menu button disappears as only two out of three can be displayed (one is active and the other two are available). This is not a problem because there is a physical Activities button just below the screen. The results of my tinkering have produced the perfect remote control. I even love the physical shape. The remote becomes your single point of contact with your system. It’s hard to describe how the Harmony One becomes the system’s personality, but it does. The Harmony One has rechargeable batteries and comes with a charging cradle. I have never had a dead remote in the past eight months (the batteries last a long time). It goes to sleep in a few seconds if left still. A simple shake wakes it. The ultimate test of this remote is can SWMBO* use the Home Theater system – can she turn the TV on or watch a DVD without help? With the Harmony One the answer is Yes! This entry was posted on 7 January 2010 at 6:43 pm	and is filed under Technology. You can follow any responses to this entry through the RSS 2.0 feed. You can leave a response, or trackback from your own site.